Raingardens, also known as biofiltration or bioretention beds, are gardens beds that use plants and soils to capture, filter and clean stormwater. 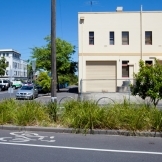 Raingardens are commonly located near buildings, roads and other impermeable surfaces. They capture runoff and remove pollutants before the stormwater enters waterways. Raingardens are also used to slow the flow of stormwater. This protects aquatic habitats and reduces the risk of flooding. Any plants can be used in raingardens, though some species, including native plants, are more effective at removing pollution. Beneath the surface of a raingarden, special layers of sand work to remove pollution from stormwater. Raingardens contain layers of sandy soil that filter litter and pollutants from the water. When it rains, water is directed into the raingarden from a nearby impermeable or sealed surface. It is naturally cleaned by the raingarden. Invisible pollutants, such as phosphorus and nitrogen, are removed by a special ‘biofilm’ that forms on plant and grains of sand. Once clean, the water exits the raingarden through a pipe below the soil into the stormwater drain. These are positioned above the ground to collect stormwater from a diverted roof downpipe. Stormwater filters through the raingarden before connecting to the stormwater system. These are positioned in the ground to collect stormwater from hard surfaces or a diverted roof downpipe. Stormwater filters through the raingarden before connecting to the stormwater system. A vegetable raingarden is sub-irrigated, which means that the water enters at the base of the garden. This helps to prevent the vegetables being submerged after heavy rain. Water is used more efficiently as there is less surface evaporation. Vegetable raingardens are typically in raised planter beds. 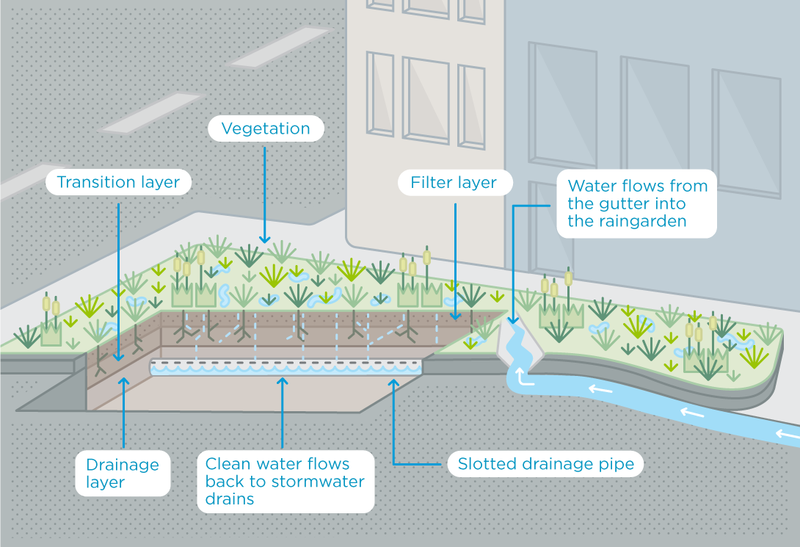 These small raingardens capture stormwater runoff from roads. Unlike a typical raingarden, they contain a single tree and are well suited to highly urbanised settings. 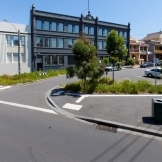 Read the raingarden tree pit case study to learn more. Raingarden technology can also be used as part of a stormwater harvesting system. 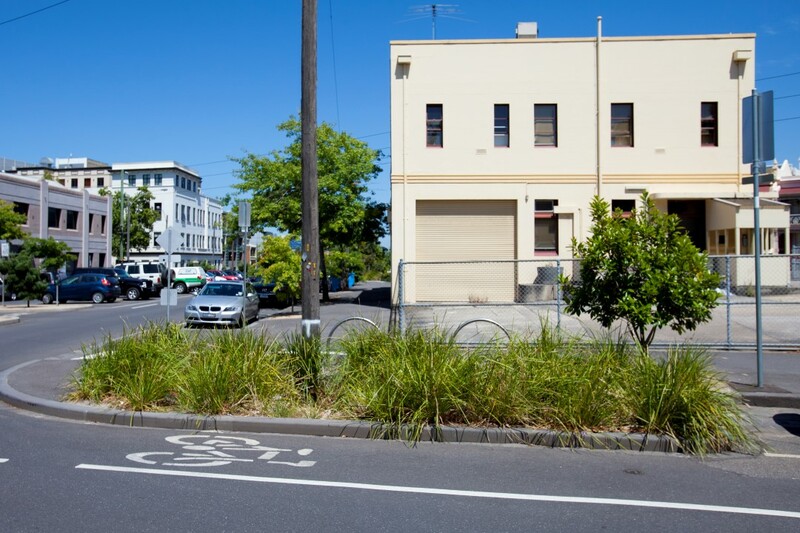 Read our Fitzroy Gardens case study to learn more. During heavy rainfall events, large volumes of stormwater collect on sealed surfaces and flow into the stormwater drainage network. Flooding can occur when the volume of stormwater exceeds the capacity of the stormwater drains. This can cause flooding in areas not necessarily close to waterways. When water comes in contact with urban surfaces such as roofs, roads and footpaths, it becomes contaminated with oil, metals, litter and other pollutants. This is what we call stormwater. Stormwater drains do not usually have any treatment systems, so pollutants are carried directly into our waterways, bays and oceans. When it rains in urban areas, sealed surfaces prevent the water from soaking into the ground. Instead, the water is collected on roofs and in gutters and flows into the stormwater drains. 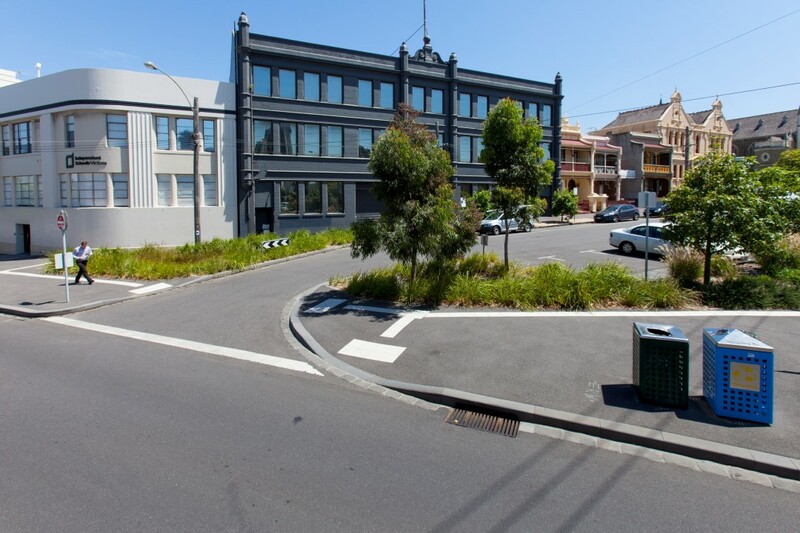 In Melbourne, most stormwater drains discharge stormwater directly into the waterways. Most urban surfaces are sealed, or impermeable. They prevent rainwater from soaking into the soil as it does in the natural water cycle. Low soil moisture in urban areas can impede healthy growth of plants, so irrigation is required to keep trees, plants and grass healthy. If there is litter among the plants in a raingarden it is a good sign that the raingarden is working properly. Raingardens are designed to collect the litter before it enters our waterways.